Change comes through young people. The elimination of gender-based violence is possible only through a professional effort invested in education for prevention. As long as our children grow up with the same stereotypes that justify violence as a sign of passion – „whoever beats his wife loves her” as an old Romanian saying goes- we will continue to have new generations of victims and perpetrators. Through this project we build up on the experience already gained by A.L.E.G. with previous activities helping children and youth recognize abuse under all its forms, overcome the myth that the victim “deserves it”, report abuse and know what do to do to discourage perpetrators. We draft and promote educational material to be used by specially trained teachers to work with students and change the beliefs that make us accept violence. 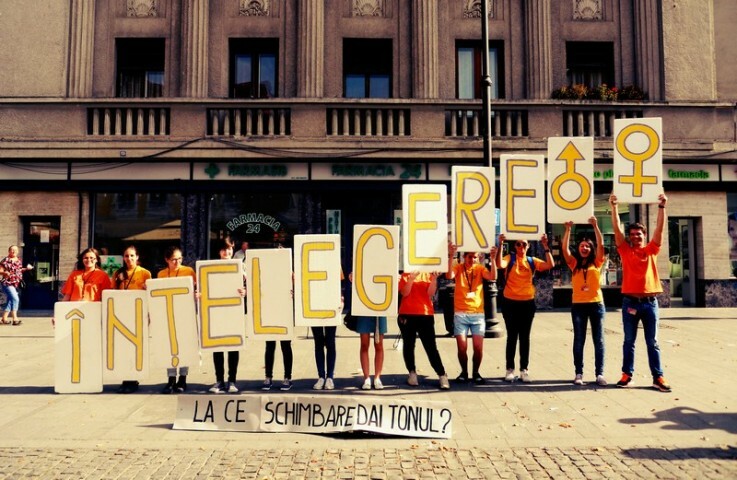 As we receive an increasing number of calls for support in cases of violence affecting young people, we clearly see a confirmation of the statistics published by the Fundamental Rights Agency which says that 24% of women in Romania have been subject to physical and/or sexual violence before the age of 15. Trapped in the „pitfall” of gender stereotypes, boys and girls let themselves convinced to fulfil completely opposite roles imposed on them. Boys are compelled to always win the argument, to be in control, to be strong, even aggressive and competitive, while girls get socialized into being sensitive, tolerant, passive and willing to sacrifice for others.Having these firmly rooted perceptions that place one of the sexes above the other, we should not be surprised at the magnitude of relationship violence, even among youngsters. It is quite a paradox how while reinforcing on a daily basis the very stereotypes that lead to violence, we claim to be fighting for the elimination of violence in our communities, failing to understand the negative roles of gender stereotypes on both girls and boys. - elaborating good practices in education for gender-based violence prevention: lesson plans and teaching material for a 13-hour module adapted to ages 13 to 16. In 2016, A.L.E.G. was one of the four grass-roots organizations in Europe and Central Asia to receive the international award With and For Girls for positive impact on the lives of girls, through activities that involve girls directly. For 12 years A.L.E.G. has been offering support to survivors of gender-based violence and undertakes action for information and awareness raising on gender equality and violence prevention. We have the experience of 2 EU trans-national projects focused on education for violence prevention in schools, involving students, teachers and parents.